I tried to adapt to gnome 3.x through the use of plugins, but nautilus was the last straw -- it is very thoroughly crippled. Although it is possible to still switch the location bar into TEXT mode, there is no button available to step up into the parent directory. You can also click on the parent directory in the location bar. So I don't understand what the fuss is about. If I remember correctly, Nautilus is no longer drawing the desktop, unless you enable that yourself via tweak tools. But you'd have to get that verified elsewhere. Tweak tool is needed to enable drawing on the desktop. I do not know what kind of functionality some users wanted like extra panel for example which I personally did not miss. I didn't follow the discussions on lwn.net and as for myself I don't miss anything in particular that has been removed, so what features do you mean? The best example was inability to change fonts easily. You had to use text editor or some third party tool. Last edited by Pawlerson; 01-15-2014, 03:10 PM. You had to hold Alt to show shutdown menu. Maybe they changed this, but I didn't use gnome since few months. However, the main problem with gnome is they don't have clear vision how it should look and behave. You're never sure what "brilliant" idea developers will introduce. They have some HIG, but it's seems it's not backed by any serious studies. It has flaws that everyone can easily point out. For example they're forcing you to use keyboard, otherwise simple task will demand more mouse clicks - in comparison to other DEs - or some others like "shutdown" won't be available at all. It's a bad design. AFAIK there is no action in GNOME 3.10 that requires keyboard, except possibly "suspend", but that does not really matter since laptops will suspend on lid close, and workstations usually suspend if you click the power button. As for visions, I disagree. 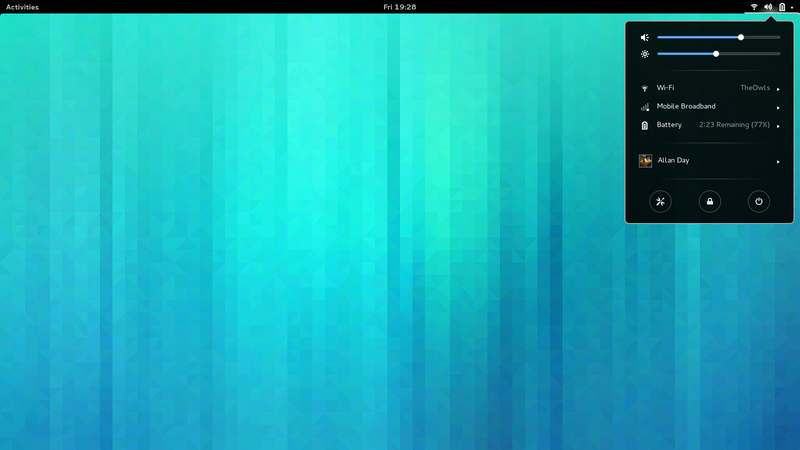 Even though the details might be unknown (as they usually are) I think the vision for GNOME is quite clear. Besides, what visions and studies drive the other desktop environments? Well, no. You can use GNOME Tweak Tool which is developed by GNOME developers as is hosted in gnome.org and released along with new GNOME versions. No, you don't need use to alt either for the shutdown option (there is no separate menu for shutdown). Bottom right icon. There are current issues that needs to be dealt with but you are not pointing out any of them. Normally the people who get the least work done are the ones who brag how productive their WM/DE is. Please, Pawlerson. I've seen enough posts of yours to know this account is only slightly above the likes of Funkstar and BOSS. FWIW I was commenting on the screenshot, which did as far as I'm concerned look terrible. When comes to comments about bsd I agree. It's because I can't take something like that seriously. Tell me, what do you need an "up" button for? Nautilus keeps your current path as buttons at the top, you can press any directory and go back to it. Nautilus opens showing home directory by default. If you need to browse your filesystem, it is faster to press the link to / from the left, than any "up" button.